On Saturday, Eastern Michigan's nominally vaunted rushing offense (racking up big yardage against Howard and Alabama State before playing Michigan) was in full force. They even threw in a wrinkle here and there to positive effect. One such instance was an 18-yard run on a jet sweep that caught Michigan's linebacking corp, specifically Kenny Demens, completely off guard. It's first and 10 on Eastern's second drive of the game. They had just completed one of three passes for the game and came out in a running formation with a tight end, H-back, and two wide receivers stacked on the strongside. A running back is aligned to QB Alex Gillett's right. (UPDATE: I just realized that EMU is in an unbalanced line here. The left tackle motions to the right side of the line.) Michigan is in a 4-3 under with Kovcas pulled into the box on the strongside of the field and Jake Ryan on the weakside of the line of scrimmage. Before the ball is snapped, one of Eastern's stacked wide receivers begins to run across the formation. 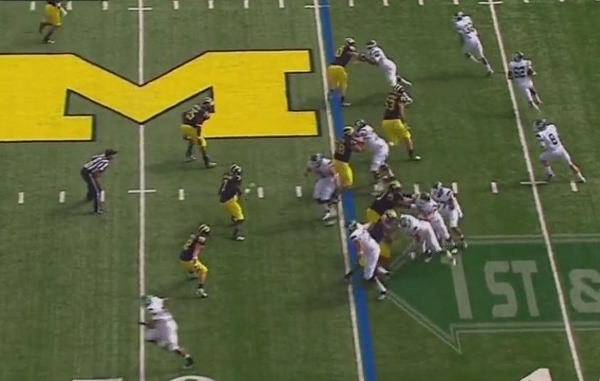 Michigan is in zone coverage and no one follows the EMU receiver. 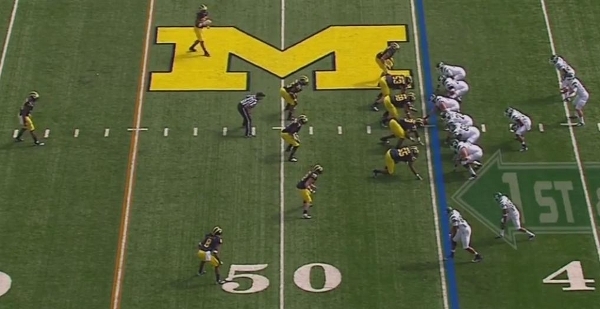 After the ball is snapped, Michigan rushes its four down linemen and Ryan on the weakside edge. 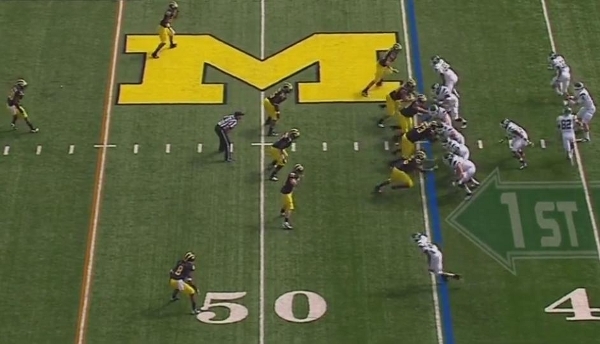 Michigan appears to be in a cover-3 formation with three underneath defenders (Demens, Brandin Hawthorne, and Kovacs). The EMU running back immediately starts running to his right, which is a key to the linebackers that the play is headed in that direction. 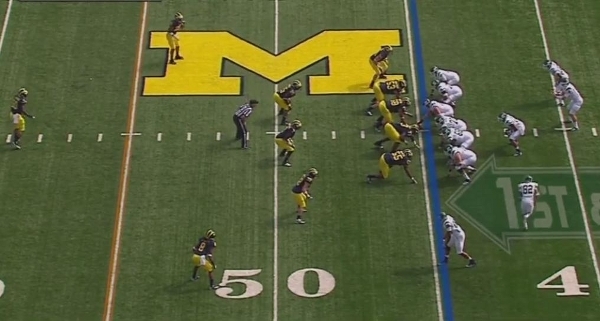 Even if it isn't, I believe it's Demens' responsibility to cover the weakside under zone. A moment later and Gillett has handed the ball off. (FWIW, this was not a zone read. It was a direct handoff.) Demens still hasn't moved. Ryan is doing his best to contain the outside but can't compete with Eastern's right tackle tight end. 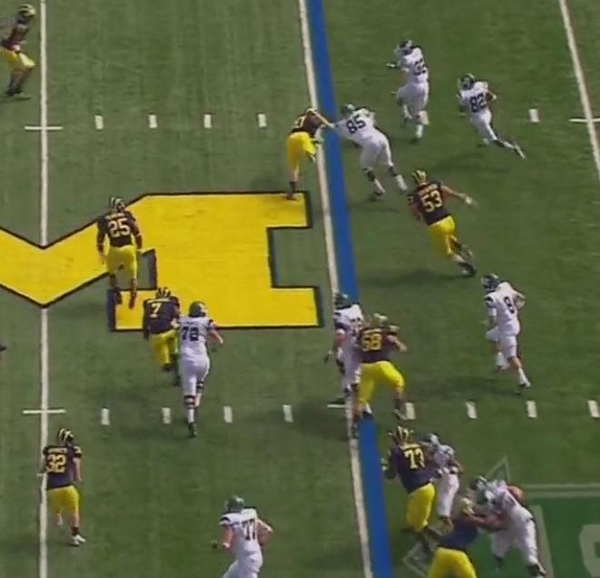 As EMU's wide receiver begins to turn upfield, Demens hasn't taken more than a step in the direction of the play. Van Bergen is already in pursuit from the backside. Demens is looking into the backfield at Gillett. At this point, Michigan is in trouble. Ryan is being tossed to the ground by the EMU right tackle tight end while the ball carrier and running back hit the edge with only Troy Woofolk between them and the endzone. Demens still isn't charging after the play. The ball carrier cuts upfield beyond his blocker where Woolfolk takes an angle to push him back inside. 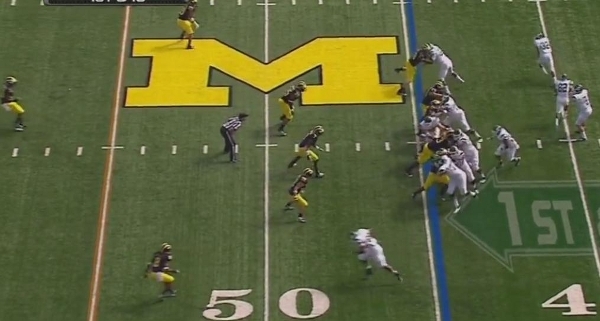 If this was an option play, a pitch to the running back here would be an easy six points for EMU. Demens will take a terrible angle here and get bailed out by Thomas Gordon playing free safety and Hawthorne who has come from the strongside of the field to make the tackle. Not to pick on Demens too much, but this continues a disturbing trend in which he struggles when tasked to move sideline to sideline, whether in coverage or here in run support. Last year, Demens was caught staring into the backfield on a few passing downs and blew his coverage (though he remedied that issue a few games later). But even this year against Notre Dame, Demens forgot his assignment and the Irish were able to easily throw a slant route. Here, Demens fails to recognize the play until it's far too late. In fact, he barely recognizes the play at all. 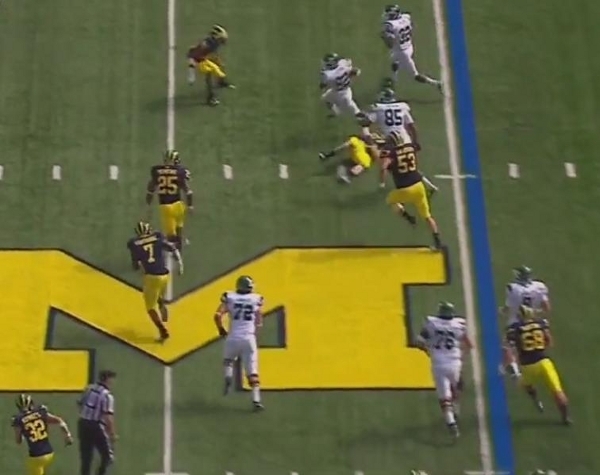 But probably more bothersome is that he doesn't appear to know where his support is on this play. With Kovacs in the box on the strongside of the field and Hawthorne next to him, Demens needs to start moving once the wide receiver sweeps across the formation. If Ryan were dropping into coverage instead of rushing, Demens wouldn't have that outside responsibility, but with Ryan rushing, that leaves on Woolfolk to cover against a ball carrier and blocker. When attacking downhill, Demens is decisive and hits gaps with force, but when you ask him to cover across the field, he's shown a tendency to make mental errors and struggle with his decision making. And though he appears to learn from those mistakes, that he keeps making them is problematic. He can't continue to blow his coverage this badly if Michigan's defense is going to consistently stop drives. That is superior analysis. Props.